After scouring craigslist and ebay for an old fashioned, fold-out sewing machine table with no luck, I happened to walk into Goodwill one random day this summer just to see what all they had...never expecting to find this! 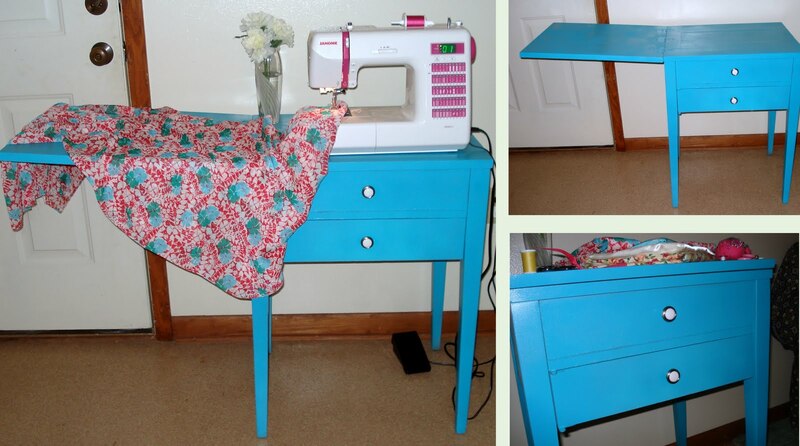 Ah, a fold-out sewing table!!! I asked the saleslady how much it was and she said $6. I tried not to seem overly excited, but I was almost jumping up and down! 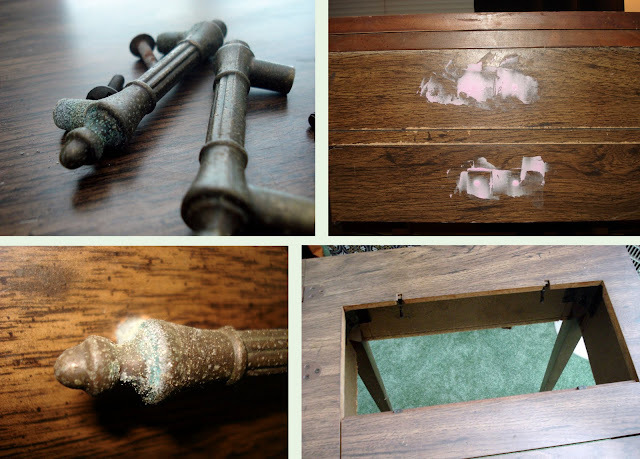 The table was in fairly good condition with only surface imperfections. Structurally, it was fine. And for $6...can't beat that! I hauled it out to my car (and did I mention it was HOT! Have you ever been in humid Arkansas heat?!) and headed over to Lowe's to get some pretty-ing-up supplies! 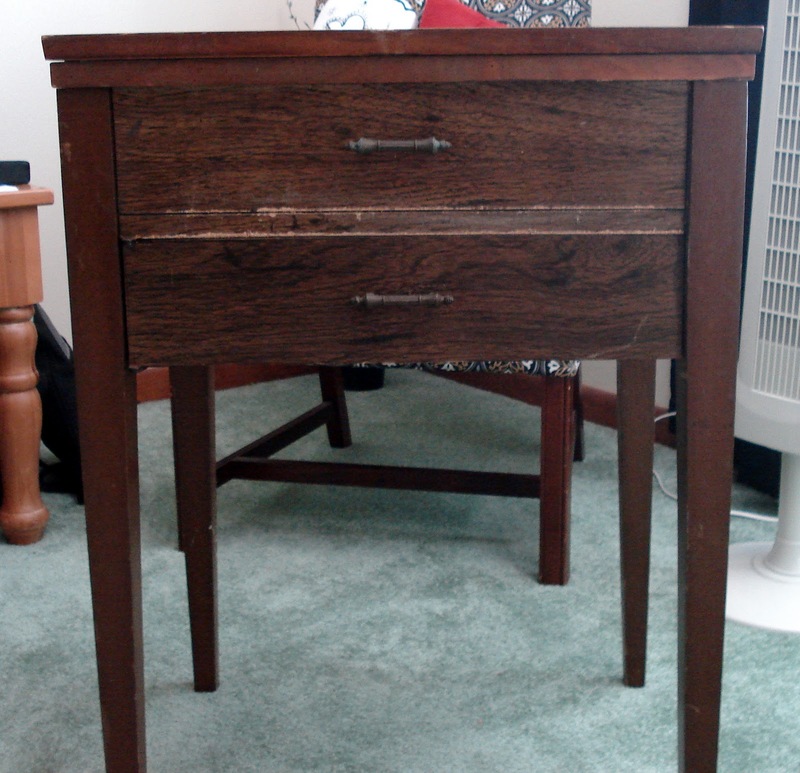 The table is not completely wood, and the surface is some kind of laminate over what looks like particle board. So, I thought paint would be a fun choice since staining it was definitely not an option. 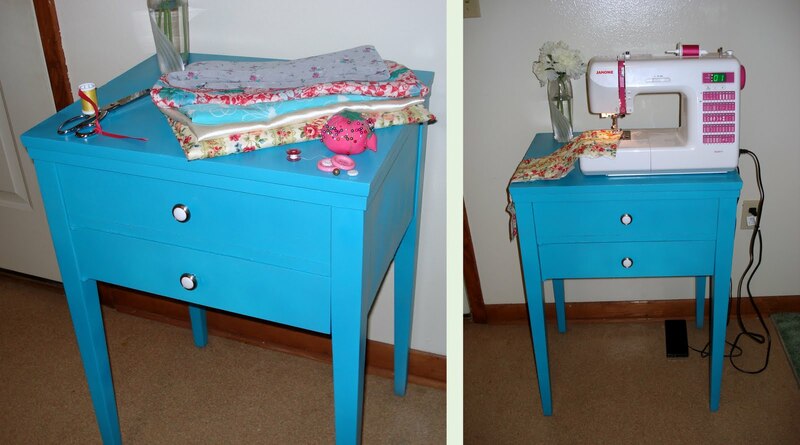 And plus, I could pick a cute, girly color and my husband wouldn't even care since it's my sewing table! 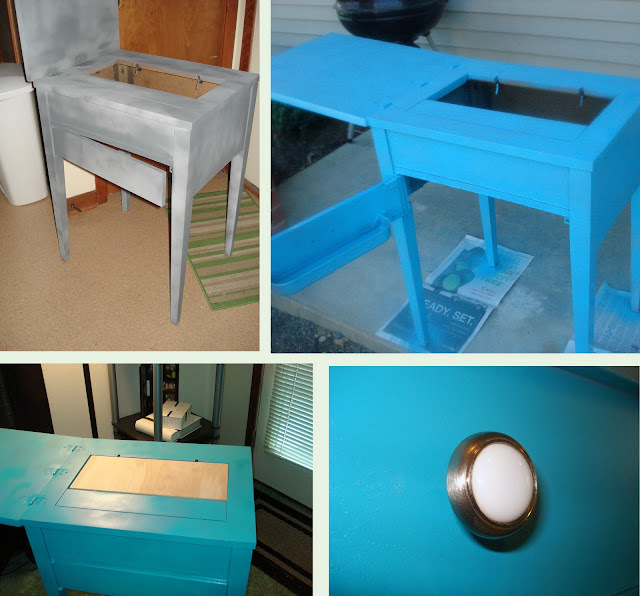 I used Valspar, gloss spray paint. The gray color is just the primer. The turqouise color is called Exotic Sea. I filled in the hole with a piece of wood that I had Lowe's cut to the measurements of the size of the hole. I got to use my power drill for the first time! Ha ha...I say "my" power drill...but it's actually "our" power drill....we got it as a wedding gift, but dear husband hasn't used it either! Added the new knobs, which I have to say are just about my favorite part!.. Overall, I am so pleased with how it turned out! The table is the perfect size, I usually just leave it folded up, but then when I'm doing larger projects, it's so nice and convenient to be able to unfold the top portion for added table space! Not to mention, this project was a whole lot of fun! Each of your comments brighten my day and make me smile! Thanks for reading! Blog design by Anna Calvert. Theme images by Jason Morrow. Powered by Blogger.